Deftly manipulating a muted palette of blacks and greys, art director and former Wallpaper* stylist Despina Curtis has conjured another one of the elegant, minimal interiors for which she is becoming known. 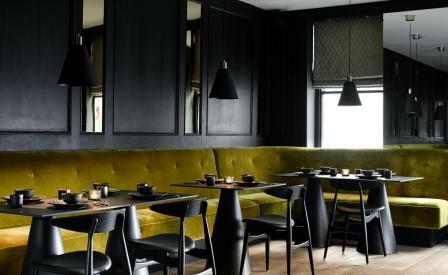 Quietly dramatic, were it not for the lush, wraparound olive green velvet banquette and Chinoiserie-lite hand-printed wallpaper, the black wood panelling, sculptural tables and chairs might not look out of place in deepest Helsinki. This understated sophistication sets the scene for Izlinda Baharom’s menu of delicate Malaysian favourites, taught to her by her grandmother. As befits a country home to many cultures, this means a mixture of traditional Sichuan, Singaporean, Indian and ethnic Malay dishes like fried boneless chicken, crispy cereal king prawns, roti canai with chicken curry and rendang beef. Zheng gives particular emphasis on Chinese-Malay specialities like stir-fried Char Keuy Teow noodles and its selection of new and old world wines, chosen by Baharom’s husband and general manager Adam Abdallah, a graduate of Taipei’s Michelin-starred Din Tai Fung, is perfectly paired. The Chelsea premises marks the couple’s first foray into the capital but devotees will be relieved that the menu, honed since 2014 at their Oxford restaurant remains faithful (minus the dim sum), to the original.